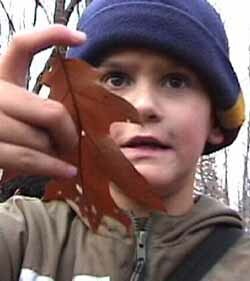 For 25 years, young Macoun Club members have been choosing particular forest trees for their own; hundreds have been chosen. Rob maintains a brief update on every tree ever chosen up until 10 years ago. On every visit, we go back to see how our trees are doing. We look for signs of life and health, as well as injury and disease. What other life forms are involved in some way with our trees? Every member finds out for themselves. Who has had the littlest tree of all? Possibly the smallest study tree of all was Jessica’s seedling Sugar Maple. She chose it on September 15, 2001 (left). In November she found it, leafless and in winter dormancy, right beside the same mossy stone (below). We could tell from the brown marks on the leaves that this baby tree had already weathered most of the year’s growing season when this picture was taken. It would have sprouted four months earlier, in May. It will produce more recognizable maple leaves in its second year. The thin pointy thing right in the middle, between where the two green leaf stalks join the stem, is the bud that is next year’s stem and leaves. 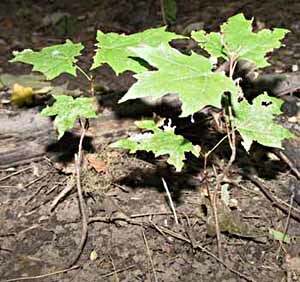 You can’t find baby maple trees every year. Sugar Maples save up their energy for years before producing a good crop of seeds. 2000 was a year of maple flowers, with the resulting seeds germinating the following spring (2001). But in 2001 the big trees were recuperating, and didn’t produce any flowers. No flowers, no seeds. 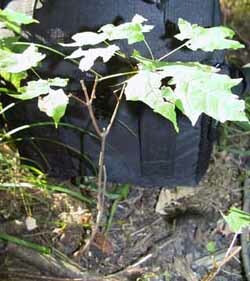 And no new baby Sugar Maples in 2002. The last really heavy seed year before that was in 1992. The next wouldn’t happen until 2013. On May 3, 2002, new leaves were just unfolding from the bud. We have never been able to find it since, though we know precisely where it was, and wonder if perhaps a browsing deer plucked the entire seedling tree out of the ground. 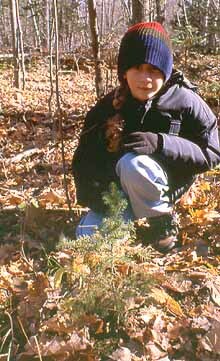 Where is this Balsam Fir seedling? 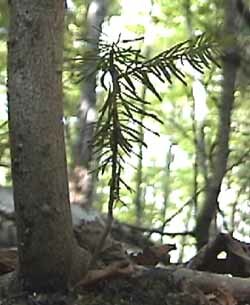 The next smallest tree is a Balsam Fir seedlng. You can almost count the number of needles on it! 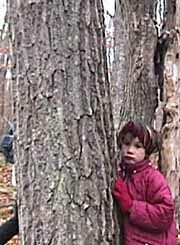 Natasha discovered this baby tree in a protected place, beside a small sapling and between two large Yellow Birch trees in the autumn of 2001. Firs are trees of cool, moist forests, and so are Yellow Birches. 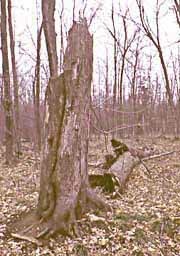 In this woods, neither of these species is found much away from the swampy, conifer-dominated margin between the Sugar Maple forest and the neighbouring flood zone. Perhaps the micro-climate in this special location enabled Natasha’s Fir to survive the drought of 2001. But dryness is not the only thing a little tree has to contend with. Trees have to grow, and this one has had a setback. After two-and-a-half years, in April 2004, we found that the side branch was gone. Perhaps a rabbit nipped it off. So this seedling started the year with half as many needles to make food with. But by season’s end, in September, it had put forth a burst of new growth from the top. It added enough new growth to permit it to shed a few of its lowest, oldest needles, which have now turned brown. We watched, year after year, but Natasha’s Fir never seemed to get any bigger (about 2 inches tall). And one spring day, April 19, 2008, we found it had been stripped of every needle, apparently having become a nibble for a deer. The green was gone out of it. It died, and soon even the little stick of a stem disapperaed. ‘My tree is small, 41 cm (about 1 foot) tall, so I will be able to watch it as it grows. You can tell how old this kind of tree is by counting where the branches come out of the trunk. I was surprised that my tree was only eight years old, since it is so small. My spruce grew about one inch between May and October, 2000. 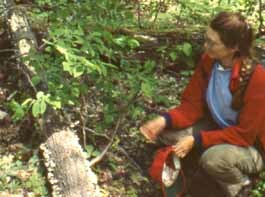 In early May, 2002, Kathleen found her tree healthy, but something (a rabbit?) had nipped off the topmost buds. 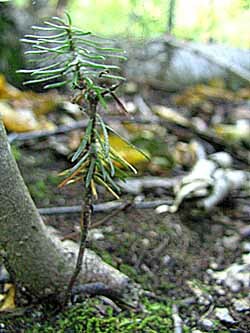 The spruce grew steadily for 10 years, reaching a height of about 30 inches. It was doing well, considering the shade it was living under. In 2012, however, a month-long drought set in — not a serious amount of time, but serious because it came on the heels of 12 months of below-average precipitation. The needles on most of her tree dried up and fell off the branche, and the branches never recovered. They died. Kathleen’s tree looked dead, as did many of the little spruces around it, but close examination revealed life in two long, low branches, almost hidden in the leaf litter. They have persisted, and after three years began sending up new vetical shoots in 2015 — a new trunk for the future! Susan and her sister, Terri (who also chose a Leatherwood to study) found small, brown insects and their sticky white egg masses on the lower side of the twigs. These were identified as treehoppers. Now they’re losing their exclusive habitat. A series of mild winters exposed even her second shrub to browsing, and in September 2004, it was just barely alive. 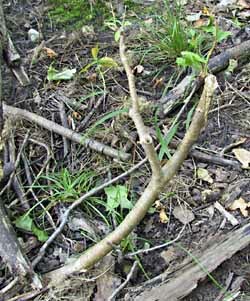 As shown at right, there werre just a few tufts of scrawny leaves at the torn-off ends of the main stems — no twigs left at all. ‘The Leatherwoods may survive another few years of this torment,’ Susan suggests, ‘but consider this a memorial to Dirca palustris, a species that new visitors to the Study Area may never see as anything more than chewed-up sticks, with few leaves and a short life expectancy. Ten years later, in 2016, a new little Leatherwood shrub was noticed almost excactly where the old one was. Delayed resurrection? ‘My tree is a spruce,’ says Stephen. 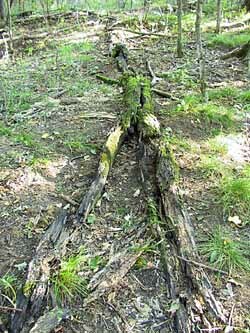 ‘It is about nine feet tall and 40 to 45 years old. The branches at the bottom don’t have any needles on them. My tree is right next to another, larger spruce so it may not get enough sun. The upper half looks healthy. The deer did not return in the fall of 2001. After the winter, the tree looked healthy except for some small branches that had lost their needles. In the subsequent 14 years, this tree seemed hardly to have changed, but in 2016 it looks just a little thin. Something split this Basswood tree open from top to bottom! At left you can see Andy beside his tree. At right, a view looking right up the deeply grooved side of the trunk. The wood of the Basswood is one of the softest in the lumber store, but in the living tree it is incredibly tough and resilient. 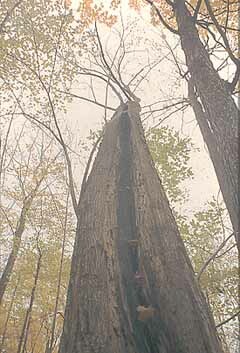 Although the wound is on the upper side of a long, leaning trunk, where it will collect rainwater, the remaining wood has toughened itself up against decay, and strengthened itself against the relentless pull of gravity. ‘I last saw my tree on May 3, 2002,’ said Andy. The leaves were not yet out then. It is still alive in 2016. Frank’s sister, Lucy, who is shown here with Frank’s tree, chose another mature Red Oak for herself a little farther north, because there was a Porcupine high up in its branches. “Basswood 18*18” has always been someone’s top choice, both by the Porcupine(s) that denned inside, and by the many new Macoun members who latched onto it right away (but who, sadly, left no permanent record of their observations in The Little Bear or on this website). “18*18” is short for 181*181, the coordinates of this tree on a special map we made of this 10-acre woods. This landmark tree was notable because it had a big, round den hole on one side (often with a Porcupine visible inside). By springtime, there was always a really big pile of ‘porcupine peanuts’ around the base. The Porcupines living here, one animal taking the place of another over the years, had a big impact on the surrounding forest. These animals typically have their favourite feeding trees, from which they will either peel bark or cut branches year after year, until the tree dies. To find the best tasting trees, Porcupines nibble in passing as they wander around the woods, thus scarring many other Study Trees. One member’s hundred-year-old Sugar Maple died from having its trunk girdled in this way by a Porcupine based in Basswood 18*18. 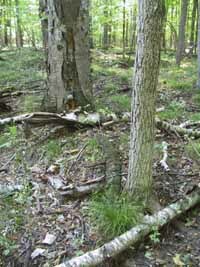 Although, at probably 125 years, it was not particularly old for a Basswood, it was in declining health for a number of years, with a thinning crown from 1995 onward. While the trunk was hollow, with rot setting in where it was filled with masses of moisture-holding porcupine peanuts, the real trouble was probably in the tree’s top, where one of the more recent resident Porcupines foolishly cut away the foliage-bearing twigs and ate them. The tree lost what few leaves it had 6 weeks early in 2001, and may have already been dead then, as it did not leaf out in 2002. It finally fell down in the summer of 2005. The trunk broke off at the point where the den opened, and fell southeast, crushing its own sprout, rising from the root collar. The tree broke into several long, hollow pieces. The Porcupine, which survived the catastrophe, took up residence in one of them. But eventually, even the hollow log collapsed down to lie flat. 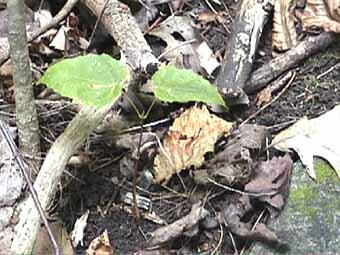 Matthew chose a pair of Sugar Maple seedlings, shown at left. They are just beyond the northern end of Kathleen’s new study log. Though they’re small, they have big leaves. Keiana also chose a little maple in the same part of the woods (right). If you look along the stem, you can see that its lead shoot has been damaged. When that happens, a side bud takes over, and the stem becomes crooked. 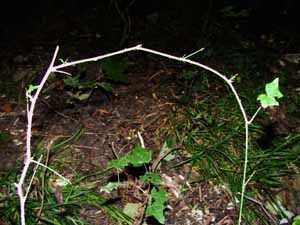 Sometimes two of the side buds, which are opposite each other in maples, begin to grow. This produces a forked trunk, which can give a tree a lifetime of trouble. Unfortunately, these several baby trees, like thousands of others all around, started out in life at what turned out to be a very wrong time. Every last one of them was soon browsed to death by an overly large Deer population. Kathleen B. had a tree, a spruce just about as tall as she is, but after a long illness it died. It had been small, so on the last field trip she chose a new tree, a bigger one, but it is just as dead. In fact, this tree has been dead so long its bark has all fallen off. But the bare wood isn’t quite bare — it has a hard black coating that looks like charcoal. Charcoal, however, would rub off on your fingers, and this doesn’t. Also, this is just a thin, smooth layer on the top of the wood. When wood burns, the charring penetrates inside. 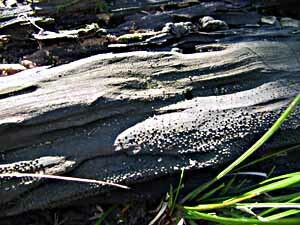 The log is whitish brown under the black coating. The picture at right shows tiny bumps on the black surface, which confirm that this black layer is a fungus, Ustilina vulgaris. 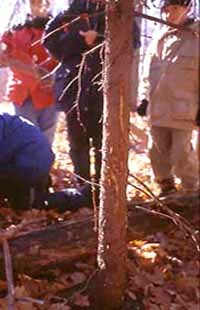 A log can be hard to identify without the bark, but Macoun Club leaders know this one was a Sugar Maple, because we remember when it fell down. Rob counted 109 annual rings in the stump. Some trees, like some people, are really popular and get chosen over and over, in this case by both those who study, and those who are studied. 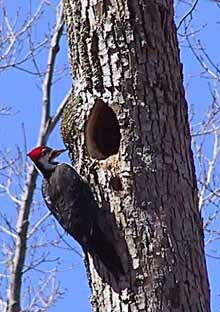 Over the years, Pileated Woodpeckers have drilled so many nest-entrances and roosting holes in this tree that we have nicknamed it “the holey ash.” The latest tenant was photographed on our April 9th (2005) field trip, and the sight inspired Jocelyn to choose the tree itself. Before her, Johnny had it, and long before him, Hugo Kitching was the first, back in 1991. Hugo published the only account of it we have. “It looks healthy and sound,” he said, ” except for three old woodpecker holes in a row.” These holes were used by a roosting Pileated Woodpecker in the winter of 1991/92. Toward 4 p.m. on winter afternoons, it would go in the bottom hole, and look out the upper ones. In the summer of 2014, the Holey Ash had a fairly full crown of green leaves, but a year later it was found dead, the trunk having snapped off about 25 feet up, above the old woodpecker cavities. The annual rings exposed by the break were unusually narrow (< 1mm), so Rob Lee counted them. Total: 145. This means that the tree was already a 25-foot tall sapling in 1870, and was probably already 20 or 30 years old then. It is now know to have been the Study Area’s oldest living tree — after it died. There are other things in the forest to study! While Alex chose a standard tree, tall and straight, his brother David chose the perennial sedge clump at its foot. 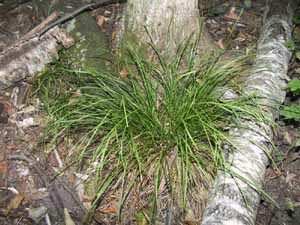 Sedges are like grasses, and often form the low, “grassy” cover in maple forests like ours. David’s is in flower now, at the beginning of May. Former member Stephen Darbyshire has identified David’s sedge for him as Carex pedunculata (Muhl. ), which, it turns out, was a great choice for someone like David who is really interested in insects. Carex pedunculata was the first North American species of sedge identified as a “myrmecochore” — a plant whose seeds are dispersed by ants. In a 1976 issue of the American Journal of Botany (Vol. 63, No. 8, pp. 1071-1079), researcher Steven Handel described laboratory experiments that made sense of many of this plant’s morphological and phenological features. Workers of the ant species Aphaenogaster rudis carry the seeds to their nests, which are in rotten logs, eat the parts that don’t matter to the sedge, and throw out the portion that does along with other nest debris. The seeds later germinate, and new sedges grow in places determined by the ants’ behaviour, rather than chance. Nicky’s choice was another non-tree study plant — a wild raspberry cane. It seems odd to find sun-loving raspberry plants growing in a shady forest, and we will be interested to know if it survives. This one had had most of its leaves bitten off by deer, which is not a good start. If the plant lost its leaves before making enough food for next year’s growth, it will be too weak and die. All photos donated or provided by members and leaders, past and present. Last updated (in a minor way) May 20, 2016. Coding revised in May, 2016.